POUND-FOR-POUND STAR VASYL Lomachenko recovered from his first career knockdown as a professional to secure a sensational stoppage of Jorge Linares at Madison Square Garden, New York, on Saturday night. Lomachenko’s triumph in an exhilarating exhibition of boxing saw him rip the WBA World lightweight belt from Linares’ grasp, in doing so becoming a three-weight world champion in only his 12th fight as a paid athlete. In his achievement, the two-time Olympic and world amateur champion joins the pantheon of punch-for-pay greats. At the time of his 10th-round stoppage, Lomachenko led on one scorecard, trailed on another and was level on the third. Venezuelan Linares, who had vowed to suss out ‘Loma’s timing before committing to any power shots, was the aggressor but largely inaccurate in a tentative opener: Lomachenko, ever-fluid, kept his head in perpetual motion and out of the line of fire, rendering it difficult for Linares to detonate with anything significant. The Ukrainian landed a tidy left to the body moments before the second bell sounded. In the second round, Linares returned fire to Lomachenko’s rib cage but was left worse the wear for it: Lomachenko popped him back before raising a roar from the electrifying crowd with a forceful combination to the body and through Linares’ guard upstairs. Though Linares found marginally more success than he had a verse prior, Lomachenko finished on the right side of a fleeting exchange to squeak it. The ante was upped in three as both men came to terms with the sizeable task in hand. Though each had weighed in at 134.6 pounds, Linares outweighed Lomachenko by close to a stone in the ring. 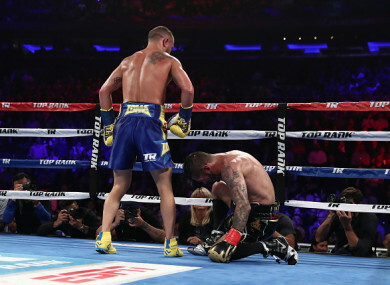 His size wasn’t proving an issue, however, as Lomachenko tiptoed and swivelled into advantageous positions and left his mark. Linares did catch Loma with a sweet left uppercut with a minute remaining, but the two-time Olympian again made him pay with a stinging combo to the body. The smaller man was sensational for most of the fourth, increasing his output and throwing in threes and fours to either floor. A clever right uppercut-jab hybrid jarred Linares, who was feeling the heat but remained mobile and active. He timed Lomachenko perfectly with a succinct overhand right with 30 seconds ’til bell, but the eastern European again had the last laugh as he rubber-stamped his dominance. Lomachenko kept his foot on the pedal through five, feinting and pivoting before landing in twos and threes. An eerily accurate three-punch combination – with a nonchalant left the icing on the cake – brought the Madison Square Garden crowd to its feet at the bell; Linares, bothered and swollen, gave the challenger a look of near disbelief before retreating to his corner. He delivered a tasty combination to Loma’s body halfway through the sixth, but took a left to the midriff for his troubles. And then a gasp: as Lomachenko wandered forward in his southpaw stance, Linares dropped a bomb of a straight right down the pipe and landed Lomachenko on the seat of his pants. The Ukrainian was stunned, too: though he beat the count with ease, he spent the rest of the round on his bike as Linares contemplated the pursuit of greatness. In the end, the South American coasted to the bell, cognisant that were he to over-commit he might undo his 10-8 round. The knockdown was Lomachenko’s first taste of canvas since the 2007 world amateur championships – his maiden decking as a pro. He enjoyed the better of a busy seventh having fully returned to his senses; going back to his basics – which would be considered highly advanced by most – he jabbed and prodded his way back into control, though did swallow a couple of neatly-delivered hooks before we headed for the eighth. ‘El Nino de Oro’ delivered a one-two to the kisser at the resumption, but halfway through eight Lomachenko upped the ante again, pouncing upon the cut which now flanked Linares’ right eye. Linares responded with some decent work, but Lomachenko probably entered the ninth in the lead having shaded another high-octane round. Halfway through nine, Linares had outlanded Loma 112-83 in power shots, and he might have levelled the scorecards, too, in a stanza which saw him buzz the lighter man with razor-like attacks. And then, with his aura of near-invincibility under threat and the WBA World lightweight title fully up for grabs, Lomachenko dropped the curtain from nowhere. The challenger put together his most thrilling combination of the contest, rocking Linares with a fusillade delivered from either hand. As the Venezuelan retreated, hurt, Lomachenko feinted upstairs before sneaking a scythe-like left hook beneath Linares’ tucked elbow, straight to the liver. Linares crumpled to a heap, and though he regained his footing at the count of eight, remained on his haunches in agony. Referee Ricky Gonzalez waved the fight off as Lomachenko leapt to the ropes and saluted the wild New York crowd. A the time of the stoppage, 2:08 into the 10th, Lomachenko was up by two, down by two, and level on the three judges’ respective scorecards. Linares lost little other than his title in defeat, and produced a performance which justified his own positioning in many pundits’ pound-for-pound top-10s. It’s the first ‘L’ on his record since March 2012. Lomachenko, the new champion, has won championships in three weight classes since suffering a controversial defeat to Orlando Salido in his second outing. With his 10th-round TKO of Jorge Linares, Vasiliy Lomachenko becomes the 7th fighter to win world titles at 126 (featherweight), 130 (junior lightweight) and 135 (lightweight). As you were. Lomachenko the GAWD. Email “Lomachenko climbs off canvas to become three-weight world champ with stunning stoppage”. Feedback on “Lomachenko climbs off canvas to become three-weight world champ with stunning stoppage”.